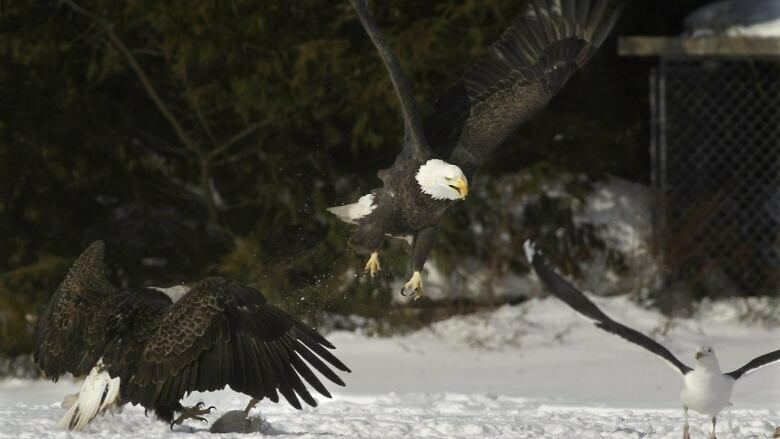 A member of the Nova Scotia Bird Society says the practice of feeding bald eagles chicken carcasses may be affecting other bird populations in the province. An avid bird watcher in Nova Scotia says the practice of feeding bald eagles chicken carcasses may be affecting other bird populations in the province. The free chicken feast began in the early 1960s when a few extremely cold winters hurt the province’s bald eagle population. Younger birds weren't able to get food during the harshest part of the winter. A farmer in the area decided to help them out by putting his dead chickens out for the eagles to eat. Now people flock to Sheffield Mills in the Annapolis Valley every winter to watch the eagles being fed. The 23rd annual Eagle Watch wrapped on the weekend, but farmers dump the dead chickens all year long. The long-time bird watcher says that's making a difference even in the Bird Islands of Cape Breton. “For the past seven years young and non-breeding bald eagles have been camping out there for the entire breeding season, in large numbers 50 to 80 birds, eating every single young kittiwake, young great cormorants and now they’re eating the young gulls, the herring gulls and great black-backed gulls,” he said. He said the practice of dumping chicken carcasses for eagles should be studied. Maybank also said the eagles have been usurping osprey nests and preventing them from producing young. “A bald eagle nest is a big, major construction. They often find it easier to go and steal an osprey nest and take it over,” he said.